After a month of sweat, tears, and shareable GIFs, the FIFA World Cup is down to the finals. 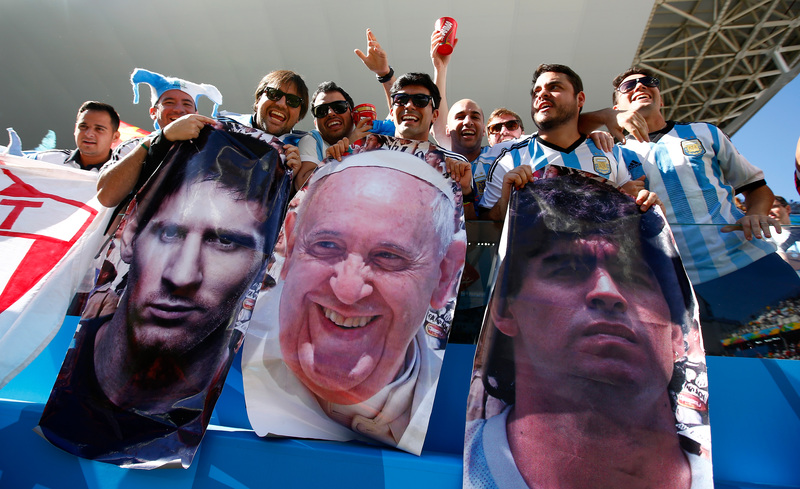 But the real question for Sunday's game between Argentina and Germany is: Which pope will you be rooting for? That's right, the World Cup final pits Pope Francis against Pope Emeritus Benedict XVI, and it won't be an easy decision for Catholics around the globe because both popes have a personal stake in the game. It might seem silly, but nationality matters just as much to Catholics as it does to football fans. There's a reason for it: For nearly 500 years, the papacy was dominated by Italian-born men. Pope John Paul II, who was a Polish national, bucked tradition when he assumed the position in 1978, causing Poles everywhere to celebrate. Pope Emeritus Benedict XVI continued the non-Italian trend following the death of John Paul II, becoming the first German pope in almost 500 years. But when Pope Francis took control of the papacy in 2013, it was an even bigger deal: Francis, who hails from Argentina, is not only the first non-European pope in nearly 1,300 years, but also the first Latino pontiff in the history of the Catholic Church. Needless to say, Argentinians have a whole lot of pride for Francis. But will Francis, who shares in the love for his homeland and is a card-carrying member of an Argentine football club, don an Argentina jersey and watch Sunday's game side-by-side with Benedict at his Vatican residence? And will the World Cup final come down not to the power of penalty kicks, but papal prayer? We should have seen this World Cup final from the beginning: With an Argentine pope currently leading the Catholic Church, it should have been obvious that the Argentina national football team would go all the way. The power of God must have been on their side this whole time, right? That's not the case, says Francis. Before the World Cup kicked off in June, Francis told the media that he promised Brazilian President Dilma Rousseff he'll remain impartial during the football competition. No special prayers for Argentina, or so he claims. "The Brazilians asked for neutrality," Francis told Spanish newspaper La Vanguardia. "I'll keep my word because Brazil and Argentina are always opponents." After Brazil's horrid loss to Germany on Tuesday, maybe Francis didn't keep his promise after all. Brazil's loss does lead us to the next point: How else do you explain scoring seven goals in a World Cup match — five of which were scored within the first 30 minutes — but divine intervention from Germany's holiest person? Although some Catholics thought Benedict was too buttoned-up and conservative, he has been known to let loose when it comes to football. He loves it. He's a longtime supporter of FC Bayern Munich, and strongly approves of the Vatican's football team (which isn't a member of FIFA). Team sport such as football is an important school in educating people to respect one another - as well as one's opponent - on how to make sacrifices for others and the value of the gifts of each element that makes up the team. ... It is in a word something that bypasses individual logic and of egotism, which often characterizes human relations, and replaces it by fraternity and love, one that promotes a genuine good at all levels. Given how good Germany's national team is this year...yeah, we know Benedict is watching. As much as both Francis and Benedict love football — and their home country's football clubs — a Vatican spokesman said the two men won't watch the World Cup final together on Sunday because the broadcast is too late in the evening for Francis' daily routine. However, Rev. Federico Lombardi told the Associated Press "we'll see in the coming days." Lombardi added that "both would want the better team to win, without taking sides." To win, we must overcome individualism, selfishness, all forms of racism, intolerance and manipulation of people. ... Let nobody turn their back on society and feel excluded! No to segregation! No to racism! If Francis and Benedict do wear their jerseys for Saturday's big game, as the reigning pontiff, Francis has the edge. This may come as a surprise, but before he devoted his life to the Catholic Church, Pope John Paul II was a goalkeeper in Poland. He loved football so much that he established a sports department at the Vatican to merge athletics with Christianity. Could JP II be helping out with Germany's defense, or will he strengthen Argentina in the final game?